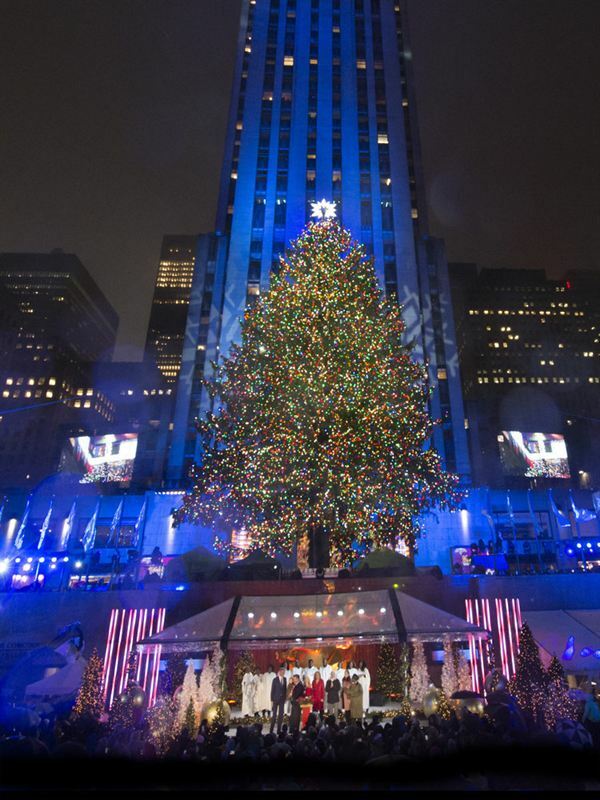 NEW YORK — Nov. 6, 2017 — NBC kicks off the holidays with the lighting of the iconic tree in the heart of New York City with “Christmas in Rockefeller Center®” on Wednesday, Nov. 29 (8-9 p.m. ET/PT). The evening with include festive performances by Brett Eldredge, Jennifer Nettles, Leslie Odom Jr., Pentatonix, Gwen Stefani and The Tenors, with additional acts to be announced. NBC’s “Today” anchors Matt Lauer, Savannah Guthrie, Hoda Kotb and Al Roker will host the highly anticipated holiday special. The 85th annual holiday special will celebrate the lighting of a 75-foot tall, 50-foot wide Norway Spruce from State College, Penn. The tree weighs approximately 13 tons and is approximately 80 years old. It will be adorned with more than 50,000 multi-colored LEDs and will be topped with a stunning Swarovski star made up of 25,000 crystals and one million facets. NBCUniversal is partnering with the Arbor Day Foundation for the ninth annual “Green Is Universal” holiday campaign by supporting tree-planting efforts to promote recovery in disaster-stricken areas brought on by the 2017 hurricanes Harvey, Irma and Maria. “Christmas in Rockefeller Center®” viewers can go to www.greenisuniversal.com to select a tree image to post online using #ShareATree from Nov 27-Dec. 25 to help in planting 25,000 trees. Each share will contribute to the Arbor Day Foundation’s tree-planting efforts, funded by a $25,000 donation from NBCUniversal. Matt Lauer has been co-anchor of NBC News’ “Today” since 1997. During his tenure, Lauer has conducted numerous remarkable and newsmaking interviews, including President Barack Obama, President George W. Bush, former Secretary of State Hillary Clinton and Prince William and Prince Harry of Wales. He has covered countless breaking news events, traveled to 44 different locations in his trademark “Where in the World Is Matt Lauer” series, and has anchored from the past nine Olympic Games. As part of his work on “Today,” Lauer won four Daytime Emmy Awards for Outstanding Morning Show. Last May, he biked 226 miles and raised $323,000 in support of Red Nose Day charities that support child poverty. Savannah Guthrie is the co-anchor of NBC News’ “Today” as well as NBC News’ chief legal correspondent. Since joining “Today,” she has conducted a wide range of exclusive interviews with newsmakers, including President Barack Obama, former Secretary of State Hillary Clinton, Facebook founder and CEO Mark Zuckerberg, U.S. Ambassador to the U.N. Samantha Power and former U.S. Representative Gabby Giffords. Guthrie has anchored major breaking news events, including the Las Vegas mass shooting, the Boston Marathon bombing, the Charlie Hebdo shooting in Paris and the 2013 Moore, Okla., tornado. As part of her work on “Today,” she received a 2012 Daytime Emmy for Outstanding Morning Show. Hoda Kotb is the co-host of the fourth hour of “Today,” alongside Kathie Lee Gifford. Kotb has also been a “Dateline” correspondent since 1998 and covered a variety of domestic and international stories, as well as human-interest pieces and features across all NBC News platforms. Kotb has received numerous awards, including the 2008 Gracie Award for Individual Achievement, the 2008 Alfred I. duPont –Columbia University Award and a Peabody in 2006. In 2012, “”Today” received the Daytime Emmy for Outstanding Morning Program. She is a New York Times bestselling author for her book "Hoda: How I Survived War Zones, Bad Hair, Cancer and Kathie Lee.” Her second book, "Ten Years Later: Six People Who Faced Adversity and Transformed Their Lives," was released in 2012. With a career spanning 35 years, 13-time Emmy winner Al Roker is the weather anchor on NBC’s “Today.” He also serves as host of “The Macy’s Thanksgiving Day Parade,” “Christmas in Rockefeller Center” and “The Tournament of Roses Parade.” As CEO of Al Roker Entertainment, he produces programming for traditional TV networks as well as OTT and digital platforms. A bestselling author of nine acclaimed books, Roker recently released “Been There Done That: Family Wisdom for Modern Times,” a book co-written with his wife, ABC correspondent Deborah Roberts. Seven years into one of the hottest careers in country music, there are more eyes on Brett Eldredge than ever before. Eldredge dropped his first three albums into the top two positions of Billboard’s country chart, including his smash debut “Bring You Back” and widely-praised sophomore project “Illinois.” His most recent effort, this year’s critically-acclaimed self-titled record, topped the all-genre Billboard Top Sales Chart upon release. He has found the same success at country radio, with an incredible six songs in a row all hitting No. 1 and his brand new single “The Long Way” climbing up the charts. Eldredge has tallied eight gold and platinum certifications, scored 2014’s CMA New Artist of the Year Award and co-hosted ABC’s “CMA Music Festival: Country’s Night to Rock.” He has earned his place among country’s finest young talents, acclaimed for his songwriting as well as his powerful, soulful vocal style. His timeless holiday album Glow is a smiling, genre-busting Christmastime surprise – a swinging, sparkling celebration of the season. Stepping out in big-band style, he showcases his musical diversity across 11 songs, including the all-new traditionally inspired title track and 10 holiday evergreens, highlighted by “Baby, It’s Cold Outside,” featuring Meghan Trainor. Eldredge and Trainor’s version of “Baby It’s Cold Outside” hit No. 1 on both the Holiday Music and Adult Contemporary charts upon release in 2016. Superstar entertainer Jennifer Nettles is one of the most admired and animated performers across music, television and on stage. ASCAP has honored her songwriting prowess with five awards including Song of the Year for “Stay.” The emotionally charged platinum #1 hit also earned Nettles a Grammy, ACM and CMA Awards. As the first female artist to be the solo songwriter on an ACM Song of the Year winner since 1972, Nettles was acknowledged with the Crystal Milestone Award. Leading with her powerhouse vocals and vivacious energy, Nettles released two critically acclaimed Big Machine Records’ albums – “Playing with Fire” and “To Celebrate Christmas” – in addition to back-to-back headline tours in 2016 alone. Next month, she will embark on a run of holiday-themed dates. As an actress, Nettles made her Broadway debut in 2015 as Roxy Hart in the Tony Award-winning musical “Chicago” and most recently starred as Donna in the Hollywood Bowl’s summer production of “Mamma Mia!” Last year in television, she reprised her role as Dolly Parton’s mom, Avie Lee Parton, in the Emmy-nominated holiday-themed sequel “Christmas of Many Colors: Circle of Love.” Nettles also played a vital role on the inaugural season of “American Supergroup,” serving as a celebrity judge alongside Elle King, Aloe Blacc and Jason Scheff. Prior to the 16th anniversary of 9/11 attacks, this year, Jennifer released the solo track “King of the City,” inspired by the tale of an immigrant window washer who died in the World Trade Center. Leslie Odom Jr. remains world-renowned for his Tony Award- and Grammy Award-winning turn as Aaron Burr in “Hamilton” on Broadway. Odom Jr. starred in “Rent” at just 16 years old and kicked off a whirlwind acting career that saw him appear in Lucasfilm’s 2012 “Red Tails” on the big screen as well as in high-profile recurring television roles on “Smash,” “Person of Interest,” “Law & Order: Special Victims Unit” and many more. In 2015, his role in “Hamilton” earned him the Tony for Best Actor in a Musical and a Grammy as a principal singer on the cast album in the Best Musical Theater Album category. Working with producer Joseph Abate, he released his self-titled debut album, “Leslie Odom Jr.” which bowed at No. 1 on the Billboard Top Jazz Albums chart. Odom Jr. updated his 2016 holiday release “Simply Christmas” with an expanded deluxe edition, including four additional recordings for 2017. He will cap off the year starring in “Murder on the Orient Express” and will release a PBS Special and new album in 2018. Three-time Grammy Award-winning and multi-platinum-selling Pentatonix has sold more than 6.5 million albums and performed for hundreds of thousands of fans at their sold-out shows across the globe. Their YouTube channel boasts more than 13.8 million subscribers, yielding over 2.7 billion video views, and their 2015 self-titled album has been certified gold after debuting No. 1 on Billboard’s 200. Additionally, seven of their albums reached the top 10 on Billboard’s 200 chart (two at #1) and received multiple RIAA certifications for multi-platinum, platinum and gold selling albums and singles. Pentatonix has recently released a deluxe version of their certified platinum 2016 holiday album “A Pentatonix Christmas Deluxe,” which features a collection of modern and seasonal favorites, a collaboration with Jennifer Hudson and holiday classics such as "Deck The Halls," "Let It Snow! Let It Snow! Let It Snow!" and "Away In A Manger." The group will commence their “A Pentatonix Christmas Tour” on Dec. 3 with three sold-out nights at The Chicago Theatre. To coincide with the tour, Pentatonix will return to NBC with A Very Pentatonix Christmas - their second annual holiday special that will air November 27th at 10:00 PM ET / PT with an encore airing on December 6th at 8:00 PM ET / PT. A three-time Grammy Award winner, Gwen Stefani has achieved worldwide success as a performer, songwriter and recording artist who has sold more than 30 million albums worldwide. Last year Stefani released her critically praised third album “This Is What the Truth Feels Like,” which debuted at No. 1 on the Billboard Top 200 and featured the gold-certified single “Used to Love You.” Stefani released her first holiday album, “You Make It Feel Like Christmas,” on Oct. 6. The disc includes a duet with fellow “Voice” coach Blake Shelton and features six originals and six classic holiday tunes. Stefani is also widely recognized as an accomplished fashion designer and entrepreneur, having created much-loved lifestyle brands L.A.M.B. and Harajuku Lovers. Stefani was announced as a Revlon Global Brand Ambassador in 2017. In addition to her fashion and music ventures, Stefani co-created and executively produced her first children’s animated television series, “Kuu Kuu Harajuku,” which airs daily on Nick Jr.
A decade after forming in their native Canada, The Tenors are an international success story. With their robust singing and seamless blend of classical and contemporary pop textures, Victor Micallef, Clifton Murray and Fraser Walters are multi-platinum certified artists featuring hit songs such as “The Prayer” and a cover of Leonard Cohen’s “Hallelujah.” Since the group’s beginning, they have shared the stage with Sarah McLachlan, Neil Young, Justin Bieber, Paul McCartney, David Foster and Natalie Cole. Their new holiday album, “Christmas Together,” was released in October in preparation of the upcoming season. With both a capella and operatic pop styles, their sixth studio album includes new songs such as “Santa’s Wish” — an adaptation of “I’d Like To Teach the World to Sing (in Perfect Harmony)” — and classic Christmas songs like “O Come All Ye Faithful” and “Little Drummer Boy” with their own signature sound. 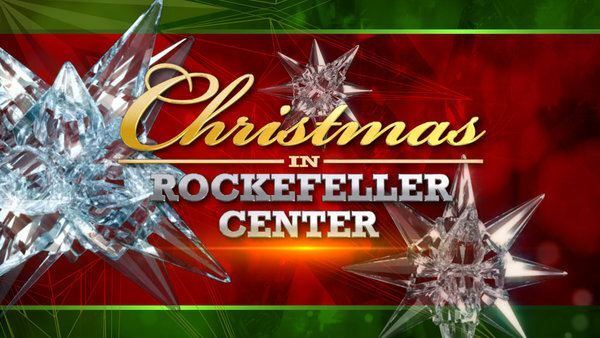 “Christmas in Rockefeller Center®” is produced by the Emmy Award-winning Brad Lachman Productions. Brad Lachman serves as executive producer, Bill Bracken will co-executive produce and Debbie Palacio directs. For more information on “Christmas in Rockefeller Center®,” visit http://www.nbc.com/christmas-in-rockefeller-center and the NBC Universal Media Village website at www.nbcumv.com.